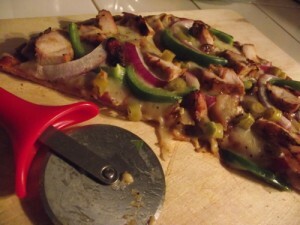 This is a quick and easy thin crust pizza with BBQ chicken, veggies and cheese. I tend to use pre-made artisan thin pizza crusts because I am horrible at baking. If you want to make your own pizza dough, fly at it, but thin crust works best for these flavors. Coat chicken breast in 1 tbsp of bbq sauce and grill until full cooked and nicely charred. Chop up chicken into bite sized pieces. Top crust with remaining bbq sauce, sprinkle with sliced veggies and chicken and finish with grated cheese. Bake in middle of oven at 400 for 10-12 min.